What is Host Guardian Service? I stumbled across this by reading about Windows Server 2019, it is a Host Guardian Service (HGS), which is responsible for providing attestation and key protection services that enable Hyper-V to run Shielded virtual machines. This “Host Guardian Service” (HGS) was introduced in Windows Server 2016 actually, and since that time, it’s possible to run shielded VMs (VMs using BitLocker to protect their disks). BitLocker keys are needed to boot the VM and decrypt the disks are protected by the shielded VM’s virtual TPM. Shielded VMs protect virtual machines from compromised or malicious administrators in the fabric, (ex. storage admins, backup admins, etc), by encrypting disk and state of virtual machines so only VM (or tenant admins) can access it. For HGS, It’s recommended to separate the roles and as such an HGS admin role has been introduced, as well as HGS Reviewers, which only allows users the right to audit existing policies. They cannot make any changes to the HGS configuration. It is recommended that you limit the overlap between the admins of your HGS (including the domain to which HGS is joined) and Hyper-V environments. By ensuring no one admin has access to both systems, an attacker would need to compromise 2 different accounts from 2 individuals to complete his mission to change the HGS policies. This also means that the domain and enterprise admins for the two Active Directory environments should not be the same person. We have this new term which goes hand in hand with HGS. A guarded fabric consists of one Host Guardian Service (HGS) – typically, a cluster of three nodes – plus one or more guarded hosts, and a set of shielded virtual machines (VMs). Hardware: HGS can be run on physical or virtual machines, but physical machines are recommended. Operating system: Host key attestation requires Windows Server 2019 Standard or Datacenter edition operating with v2 attestation. For TPM-based attestation, HGS can run Windows Server 2019 or Windows Server 2016, Standard or Datacenter edition. 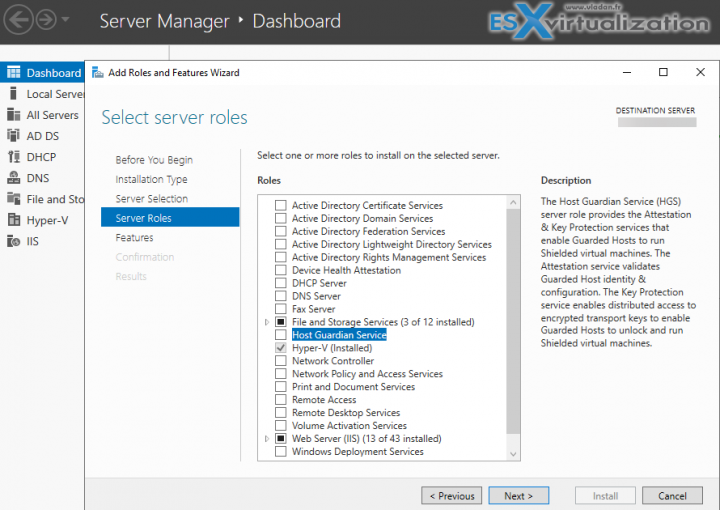 Windows Server 2019 What’s new?